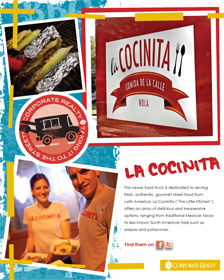 Corporate Realty Shares New Featured Recipe from La Cocinita! Thank you La Cocinita for allowing us to share this delicious recipe for Cachapas with Red Pepper and Tomatillo Sauce. Did you know that since 1997, Corporate Realty has shared a monthly mailer with our current and prospective clients in New Orleans and around the country that not only highlights our recent transactions, but a recipe or story from a great local restaurant? This year we’re featuring recipes from mobile food vendors like La Cocinita and Taceaux Loceaux that showcase the best of New Orleans’ oldest and newest culinary trend. We’ll be posting more recipes through out the year on https://corp-realty.com/recipes/ so keep visiting and be sure to try out the recipes and the chefs behind them!